When the 5D Mark II busted onto the scene in 2008, the footage from the camera amazed the masses. However, working with the footage in post-production wasn’t the friendliest of tasks. If you wanted to properly edit the footage in Final Cut Pro, you first had to transcode the files using MPEG Streamclip or some other method in order to get a file format that was workable in FCP. Canon later sped up the process by making the Plugin-E1 available for importing 5D, 1D, and 7D footage into FCP – it worked quite well; however, it’s still a time-consuming process. Then, Adobe introduced Premiere Pro CS5, which allowed us to simply drop files in the timeline and start editing – a big boon for HDSLR editors. It’s a 64-bit program that makes very efficient use of system resources. My 2.5-year-old Windows machine is able to playback color corrected video with effects and no need to render first. Jordan says he was invited to Apple, along with the “Who’s Who of leaders in the post-production community,” to check out the new version of Final Cut Pro. As someone relatively new to the video scene, I’m very anxious to see what Apple has in store for us with this Final Cut Pro update. I mainly work with HDSLR video, simply because that’s what I started with and that’s what I still use on a regular basis. I’ve used Media Composer 5, Final Cut Pro and Final Cut Express over the past year; however, when I chose to buy a NLE as my go-to editing program last year, I went with Adobe Premiere Pro CS5 because of how well it works with HDSLR footage. While I like FCP’s interface, it’s just too slow no matter what machine I’m using it on (MacBook Pro, iMac or Mac Pro). I’m hoping to see the FCP update step up and match or exceed Adobe’s capabilities with Premiere Pro CS5. I recognize that there are many other improvements desired by those working on much larger projects than my short ones. However, I would venture to say that the 5D Mark II and its lineage of HDSLRs have been solely responsible for numerous purchases of Premiere Pro CS5. Here’s to hoping Apple jumps on the bandwagon and makes the latest FCP just as attractive for those of us shooting with HDSLRs . . . ’cause I’m Jonesin for a good reason to pick up a new Core i7 MacBook Pro. I can’t imagine why an Apple guy would say it’s “jaw dropping”. Well you better get out there and grab that new MacBook Pro so you’re ready to go as soon as FCP comes out! I’m surprised that the new MBP is still max’d out at 8gb RAM, although the 1gb GPU is promising, as is Thunderbolt. 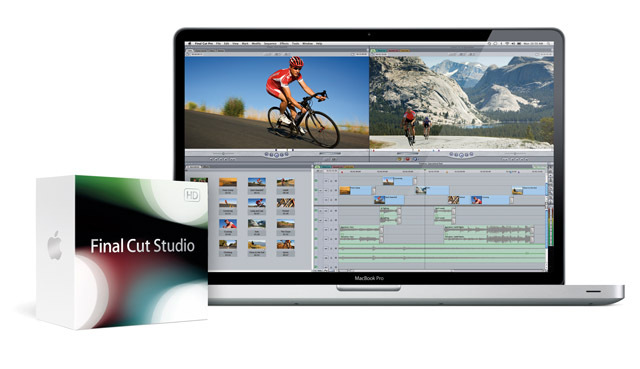 If the new FCP can do Premiere-type editing on the MBP’s relatively modest hardware, then that would be super. So, when is Apple gonna work on a release for a windows machine? I think they’s tripple their sales of FCP if they did. Wow ! I don’t understand how can you say FCP its slow or lags behind Adobe lame stupid applications !!!! As an old veteran Mac user, audio-video editor (form HDSLR to 35mm full length feature movies) and photographer I’m using all kinda Mac computers and also FCP for all of my AV post and never ever had a performance issue with it !!! In the past the greatest advantage of FCP over the competitors was that it never required hardware acceleration like ADOBE’s and AVID’s and we used to do most of the edits in realtime !!! Even color corrections !!! And believe it or not, I have clients that they’ve been and still are using a PowerBook G4 and a PowerMac G4 side by side to edit the footage they shoot with their Sony EX1 !!!! So when I read comments like yours, i just think of one thing: BAD SETUP !!!! Do u see any machine other than mac that can be that old (7-8 years) and still working ? I don’t think so !!!! I’m also interested that people are upset with having 8 GB’s of ram on their PORTABLE DEVICE !!!! I still think people are not managing thei resources good enough to get the best out of their hardware !!! Techniques like managing project in sequences and choosing right file and data management strategies will make a big difference in Audio-Video post where files are huge and resource hungry ! I hope thatr this time we’re going to be able to buy this on its own, without having to fork out for the entire Studio package. A lot of us don’t need, & can’t afford, all the other stuff!